That, of course, is the classic Twilight Zone episode (hilariously retold as "Hungry are the Damned" in The Simpsons: Treehouse of Horror I). The title comes from a book by an advanced alien race that has conquered Earth with supposedly the best intentions in mind. A lone linguist persists in translating the substance of the book, too late discovering that "To Serve Man, it's--it's a cookbook!" Or more simply stated, the evolution of man. The cycle of going from dust to dessert. The metamorphosis from being the ruler of a planet to an ingredient in someone's soup. It's tonight's bill of fare from The Twilight Zone. the immune system and maintain a healthy gastrointestinal tract, all in exchange for a constant food supply. But when you die, your friendly gut flora quickly become your gut foe. Without food, the microbes escape your GI tract through the circulatory system and spread to your other organs, feeding on your dying cells and colonizing your body. In other words, kicking the bucket makes us the main course. Reading this, I recall that in the Twelve Kingdoms, when a kirin dies, his shirei (servant beasts) get to eat him. Sort of a quid pro quo thing for getting bossed around their whole lives. I've long hoped that NHK would start distributing its Taiga historical dramas on U.S. streaming sites. Well, NHK has taken a big step in that direction. Ryomaden, one the most popular recent series, is now available on dLibrary Japan. Played by Fukuyama Masaharu (Galileo), Sakamoto Ryoma was one of the most influential figures of the mid-19th century. Japan's version of Alexander Hamilton, he founded Japan's first private corporation and drafted the outlines of the Meiji constitution. 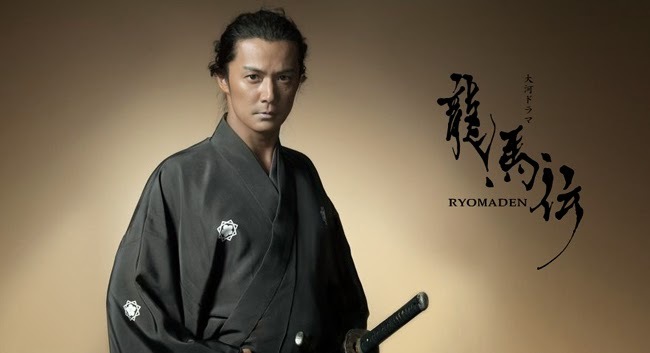 Ryoma was assassinated by government agents in 1867, a year before the Tokugawa shogunate was overthrown. His story is entwined with that of Iwasaki Yataro (Kagawa Teruyuki), a fellow Tosa countryman who would build on Ryoma's work to create Mitsubishi in 1870. An intense and engaging character actor, Kagawa delivers a bravura performance as a disenfranchised samurai pulling himself up by his bootstraps with every ounce of his strength. These lower-class samurai were the principal agents of change in the Meiji Restoration. The Perry Expedition to Japan in 1853 was the turning point both in Ryoma's life and that of the nation. Ryoma's reaction to the mind-bending technology of a steamship was: "I want one of those." He would eventually get one. Quite unintentionally, the depiction in Ryomaden of this clash between East and West, between feudalism and modernism, and tradition and technology (especially weaponry), well captures how an actual encounter with "advanced" aliens might affect the human race. The challenge is to accommodate the new without becoming unmoored from the past, because what's already there isn't going anywhere (and would stick around for decades). The authoritarian regime that had ruled for 250 years simply couldn't keep up, and was overwhelmed by the change bubbling up from the provinces. Alas, in only 75 years the new regime would grown just as sclerotic and ultimately fail even more catastrophically. But following the barely-contained chaos of the Meiji Restoration, for a few short years wistfully remembered as the "Taisho democracy" (1912-1926), Sakamoto Ryoma's vision of a New World came true. 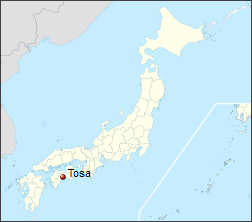 Though he might be more surprised that the political factions he helped birth in Tosa (his home province), Satsuma and Choshu (the original rebel provinces) were still moving and shaking today. Prime Minister Abe is, in fact, a Choshu man. Ryomaden runs 42 episodes, so we're talking about a serious investment of time. Familiarity with the geographical and historical context is presumed (foreigners like Matthew Perry and Thomas Blake Glover also play key roles), so keep a Wikipedia window open. Speaking of Fukuyama Masaharu, season 2 of Galileo is streaming on Hulu [update: it isn't any longer]. The only big change from season 1 is that Kishitani Misa (Yoshitaka Yuriko) replaces Utsumi Kaoru (Shibasaki Kou) as the detective who depends on the professor's crime-solving skills. Over the past fifty years, foreign "loan words" found in unabridged Japanese dictionaries have grown from 3.5 percent of entries to 10 percent. The number of loan words in everyday usage (prevalent in technical fields) exceeds 50,000. South Koreans are no less reluctant to mine English for new terminology, which has led to a growing linguistic divide between North and South. North Korean defectors such as Park Kun-ha, who fled in 2005, say the prevalence of English loanwords is a major obstacle to adapting to life in the South. "It's incredibly frustrating. They are everywhere, and it's essentially like learning a foreign language." These loan words and "loan institutions" so quickly shed their foreign roots that some, like McDonalds, are often assumed to be native products of Japan (as explained here, the Mac computer is a foreign product, the PC not necessarily). Chaucer saw French and Italian poetry not so much as models to imitate but as verbal shop windows from which he could steal words that as yet had no English equivalents. We don't just borrow words; on occasion, English has pursued other languages down alleyways to beat them unconscious and riffle their pockets for new vocabulary. Which sums up the Japanese attitude towards lexicography as well. Unlike the French, Japanese don't fear a tide of foreign culture sweeping across their shores because they know that in a few years they'll make it indistinguishably Japanese. Last month, Google executive Alan Eustace made the highest sky dive ever, jumping from an altitude of 135,890 feet and breaking the sound barrier in the process. At 24 miles high, the sky above is black, the curve of the Earth is visible, and the near-vacuum and extreme temperatures requires a space suit. And yet he was only a third of the way to the official edge of "space": 62 miles. It's another 40 miles to Low Earth Orbit (LEO). And then 100 miles on top of that to get to the ISS. That may seem like a long way to go. It's not. The Earth's atmosphere is ridiculously thin. The diameter of the Earth is 8000 miles. A good pair of lungs will take you up another three miles. If a commercial jet aircraft--cruising at seven to eight miles--depressurizes, you'll need that emergency oxygen mask to stay alive. If we generously define the atmosphere as ending at LEO and compare the planet to a baseball, the atmosphere would be thinner than a dime. Applying this analogy to breathable air only, the atmosphere is thinner than a sheet of paper. Talk apples instead of baseballs, and the Earth's atmosphere is the mere skin of the fruit. This strikes me as a bad design flaw in the inhabitable planet design spec, though if the atmosphere reached any higher, nothing in LEO would stay in orbit for long. This "skin of life" reinforces what a strange creature gravity is, simultaneously the strongest force in the universe--that can crush a star into a black hole--and the weakest. The paradox is so profound that physicists seriously theorize that gravity leaking into alternate universes saps its actual strength. But gravity alone isn't enough to keep an atmosphere down on the farm. A small, rocky planet requires a molten core to power plate tectonics and a magnetic field. The magnetic field forms radiation belts that deflect the solar wind around the atmosphere (the solar wind collides with the atmosphere at the poles and creates auroras). Mars, by contrast, lacks both volcanic activity and a strong magnetic field. Gases stripped away by the solar wind aren't easily replaced. So sans the above, terraforming Mars is a lost cause. The Saturnian moon of Titan is shielded by the magnetosphere of its mother planet. Locked in a close orbit to Saturn, tidal forces heat Titan's icy interior, creating an atmosphere denser at its surface than Earth's. 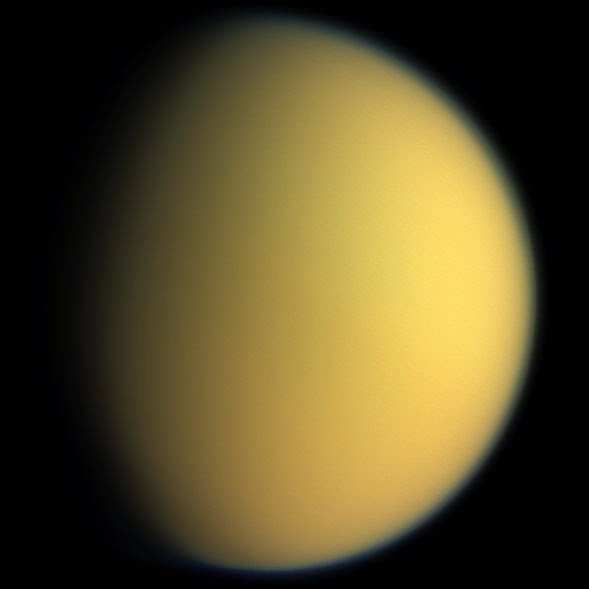 Titan's atmosphere is 98 percent nitrogen, its lakes liquid methane (-179 degree centigrade). But Titan could become beach-front property when the Sun enters its red giant phase five billion years from now and cooks the Earth to a cinder. Though a gamma-ray burst could do us in long before then. Or a really big asteroid. Closer to home, there's always the Yellowstone Caldera. It's a miracle we wake up every morning still breathing. The improbabilities of dying are balanced out by the improbabilities of existing in the first place. Like Dr. Who's Clara Oswald, Earth is, for the time being, the "impossible girl." Marty: Hey, shh, no. I totally get it. I'm sorry I let you get attacked by a werewolf and then ended the world. [incredulous] Giant evil gods. Dana: I wish I could have seen them. I'm with Marty. The only regret I have about the world ending one day is that I (probably) won't be there to see it. Throughout Buffy and Angel, Joss Whedon kept trying to end the world as we know it (an underlying flaw in both series). In Cabin in the Woods, the monsters take over and the world ends for good. Finally! The Man from U.N.C.L.E. (1964-1968) holds up remarkably well half a century later (at least the first two seasons; the third reportedly sagged badly). With Robert Vaughn as Napoleon Solo (created by Ian Fleming) and David McCallum as Illya Kuryakin (now Dr. "Ducky" Mallard on NCIS) in the leads, The Man from U.N.C.L.E. was the forerunner of I Spy (1965-1968) and Mission Impossible (1966-1973). Though while Mission Impossible presaged a future of high-tech gizmo thrillers, Solo and Kuryakin are the cool, suave, deadly (and deadly funny) analog operatives that live on in characters like John Reese and Sameen Shaw (Person of Interest). It certainly didn't hurt that back in an era when there were only three networks, shows like The Man from U.N.C.L.E. could cast from the cream of the up-and-coming Hollywood crop. For example, a 1964 episode called "The Project Strigas Affair." It guest stars William Shatner and Leonard Nimoy, along with Werner Klemperer (basically inhabiting the Colonel Wilhelm Klink character he would start playing the next year on Hogan's Heroes). This was two years before Star Trek. Shatner is utterly charming as a scientist who quits the rat race to start a small business with his wife (exterminating rats). They're recruited by U.N.C.L.E. to run a sting on a corrupt diplomat (Klemperer). It's a very Mission Impossible type plot. What makes it all the more amusing is that a fairly subdued Shatner ends up playing the straight man to everybody else, and does rather well at that. It's not fair to say, "Hey, the man can act!" because Shatner delivered some fine performances on Star Trek. The more accurate observation might be: "Hey, there was a time when Shatner wasn't Kirk!" Instead, it's Nimoy who hams it up as his (actually Klemperer's) nemesis in the "Evil Spock" role (playing dumb until he gets his revenge in the end). Frankly, it's easy to see a lot of Spock in Nimoy's "Paris" on Mission Impossible as well. But because Nimoy defined the character in more subtle terms (makeup and backstory aside), he can say "I am not Spock," while Shatner will always be Kirk at his most bombastic. 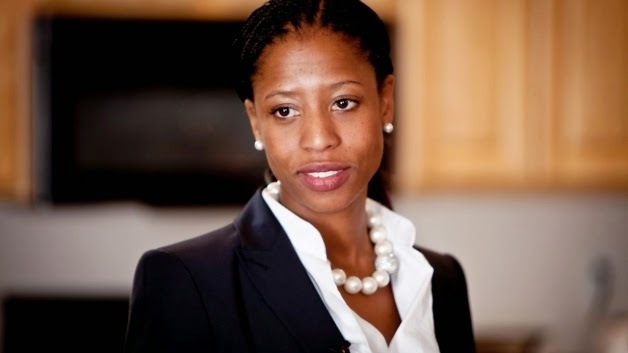 Tuesday night when I went to bed, Mia Love was trailing Doug Owens in Utah's fourth district congressional race. When I woke up Wednesday morning, she'd become the first ever black Republican woman in Congress. From Utah, no less (according to the 2010 census, 1.1 percent black). Love's political career began as mayor of Saratoga Springs, a town of 21,100 located at the northwest tip of Utah Lake. She came to national attention in 2012, when she addressed the Republican National Convention. That year, despite the Utah legislature's best gerrymandering efforts, Love ran against political veteran Jim Matheson (son of the late Democratic governor) and lost. After serving six terms, Matheson retired this year and passed the torch to Owens (like Matheson, the scion of an established political family). Owens did his level best to present himself as the most just-like-you family guy in Utah. But the second time was the charm for Love. Republicans won by the expected landslides in Utah's other three districts. For the first time in decades, the Republican party holds all of the federal offices and the governorship. Drawing in much of liberal (relatively speaking) Salt Lake City, the fourth remains Utah's only competitive district. So Love can expect a scrappy fight every two years. Though that wasn't Utah's only political first Tuesday night. At the state level, Democrat Sandra Hollins was elected Utah's first ever black woman legislator. No, analog music playback technology isn't "better" than digital. Dylan Matthews points out in Vox that the "warmness" of vinyl is a byproduct of the noise, bandwidth limitations, and mechanical dampening that playing a record involves. A record needle is shaken back and forth many thousands of times a second to produce a piezoelectric or electromagnetic signal (it's a little electrical generator). Without artificial filtering known as "RIAA equalization," the needle would jump all over the record. Add to that the noise produced by the motor and bearings spinning the record. "Vinyl" reproduces music by dragging a needle down a groove of serrated plastic. Okay, not fingernails across a blackboard but the same basic concept. It's amazing that it works as well as it does. The same audio illusion is promulgated by vacuum tube amplifier buffs. The "warmness" of a vacuum tube circuit is a byproduct of the electrical noise (hum) and dampening that are an inevitably byproduct of the electronics and can never be eliminated. Even with expensively-filtered filament current, you can never get rid of the thermal noise. Isolating the plate voltage (to keep the listener from being electrocuted) requires big transformers that also effectively filter out any high-frequency overtones. I'm totally down with the assertion that it makes for a great sound, but there's nothing "natural" about it. (The same goes for "organic" food.) As Matthews puts it, "[Vinyl and digital] sound different, and that's exactly the point." Neither audio transducers nor power amplifiers are free of distortion, and distortion tends to increase rapidly at the lowest and highest frequencies. If the same transducer reproduces ultrasonics along with audible content, any nonlinearity will shift some of the ultrasonic content down into the audible range as an uncontrolled spray of intermodulation distortion products covering the entire audible spectrum. The quality of digital converters does make a difference, and have improved dramatically in the past decade. But just as a professional can take a good picture with a cheap camera and high-end equipment won't help a talentless amateur, the human element matters a lot. give you more convincing arguments as to why one version sounded better than the other. In effect, they had better tools with which to convince themselves that their subjective impressions were correct, even when those impressions were entirely misleading. Convince people to pay more for an object with the same performance specs and they'll value it more because of the sunk costs, the replacement costs, the invested self-image, and the good opinion of their fellow devotees. This is otherwise known as Apple's business plan. And, yes, it's also true that the price/quality curve is generally positive. Though when it comes to modern electronics, the curve flattens out much closer to the low end than to the high end. Which is why you can get a decent LCD HDTV for $120.